Back in 2014 I was undergoing treatment for severe anxiety disorder and depression through our local Mind Centre in Sunderland. In the year before after a 20 year-long battle I was diagnosed with Joint Hypermobilty Disorder with a side of Fibromyalgia. I’d already had confirmation of varying other long-term and chronic health conditions. At this point there was a lacking of support groups for FibroAction, a charity that I became involved with in 2013 and still am today. 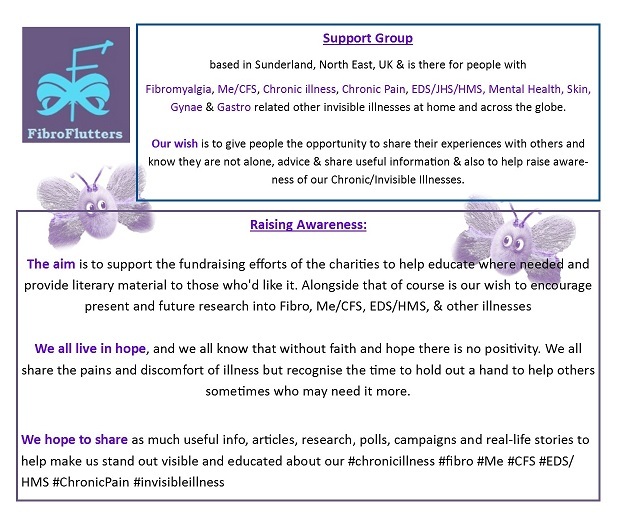 I was approached a couple of times about the idea of setting up a group for Fibromyalgia so May 12th International Awareness Day for Fibromyalgia FibroFlutters was born under the c/o FibroAction and Sunderland Mind. This is why FibroFlutters, and myself personally, advocate for the Mental Health Mind Charity, especially our local Sunderland Mind because they have helped me personally to learn how to live with my chronic anxiety & depression and provide a level of support that cannot be doubted or forgotten. I, also, pay a monthly donation to our local Mind Centre. They are still there for me today if I need them, and it was them that suggested, and then helped me to gain the courage to set up the group because many fibromyalgia patients have anxiety and depression problems that seek advice about local support groups. There are a good number of people in Sunderland with Fibromyalgia and varying other long-term chronic conditions, actually, and it shocked me in the beginning. At the time I was volunteering and advocating for a charity called FibroAction and so became a voice for the charity across the NE UK with FibroFlutters members, and readers, this is because even though there were only 5 of us but we spanned 3 counties! I made Vicky Green my Co-Founder not long into FibroFlutters Life as she was advertising us on Face book where i did not wish to have an account, also being diagnosed within months of each other and being friends it seemed a logical thing to do. Along with Ian and Elaine we discussed our health and circumstances once a month, Sonia works so couldn’t make he meetings but was in touch via social media channels and Vicky. There was 5 of us for about 18 months deciding on things for FibroFlutters and earlier this year I decided that it was time for us to show off who we were. 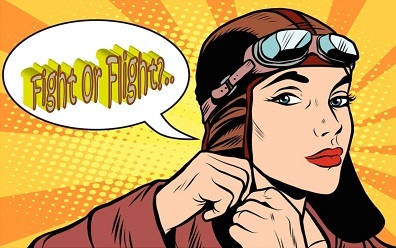 We are now the ‘Founding Five Flutters’ and together we help to steer the direction of the support group, and also work as individuals on our own interests regarding research and advocacy as we each have differing interests as well as all having Fibromyalgia, ME or CFS, with at least 3 of us also having a connective tissue disorder. Basically we are the old-style board room but with a modern approach. In 2015 FibroAction and Fibromyalgia UK (fmauk) merged and became Fibromyalgia Action (FMAUK) Uk so we now work alongside other North East UK groups when campaigning and raising awareness. This article has been extracted from the free Information booklet that FMA UK provides. To have this information presented in a professional A5 booklet, as well as the other articles please request one from the office.